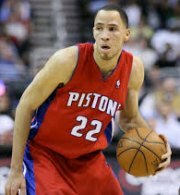 VANCOUVER -- Veteran Tayshaun Prince has found a new home. According to multiple reports, including Yahoo! Sports, Prince has agreed to sign a one-year veteran's minimum deal with the Minnesota Timberwolves. The 6-foot-9 University of Kentucky alum was a fixture in the Detroit Pistons' 2004 title run. Taken as the 23rd pick (Round 1) in the 2002 NBA draft, the 35-year old Prince is a 13-year NBA veteran who spent his first 11 seasons in Detroit before moving suiting up for the Boston Celtics and the Memphis Grizzlies. Prince split last season between the Pistons and the Grizzlies. He played a combined 49 games and averaged 7.5 points and 3.6 rebounds per. Click here to view a list of other articles written by April Marfa.